More than likely, you’ve heard the saying “you get what you put in”. In order to create a profitable online business, it’s critical you learn how to build lasting relationships. The root of all relationships is in providing massive value. In such a busy online world, it’s now more important than ever that you’re the first person to provide exceptional value, instead of expecting something in return beforehand. 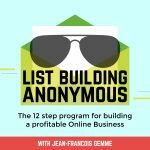 In today’s List Building Anonymous episode, Jean takes you through step three of his process to building a profitable online business: Making the decision to focus on providing value first. Enjoy the show. Make sure you don’t miss part two of this episode on providing value first with 8 figure entrepreneur guest David Sharpe.